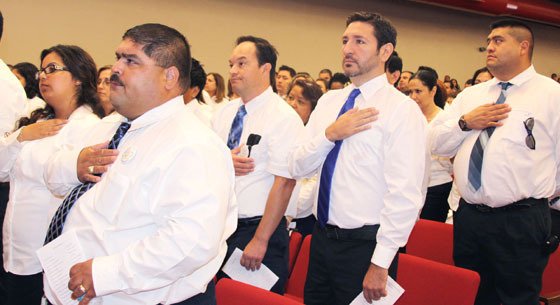 The excitement was in the air as employees from across the Rio Grande City CISD showed up for the district's General Assembly to kick off the new school year. They gathered for a breakfast sponsored by BBVA Compass before heading to the auditorium at Fort Ringgold. "Teachers play such an important role; we are proud and honored to be in the presence of such outstanding individuals. Let us go for the gold, not just in academics, but all aspects of life," said Joel Salinas, director of federal programs, who was the master of ceremonies for the morning. "What a wonderful day to celebrate educators and teaching," Cynthia Bazan, RGCCISD director of special education, said in her welcome address to her fellow educators. "You are the best of the best. To the new teachers, we want this day to be a spring board before you start the year with your students. When you encourage and communicate the excitement of learning, our children learn to be eager and optimistic." And optimism was a key theme during the morning's activities, as faculty, staff and administrators heard from district leaders including RGCCISD Board President Basilio D. Villarreal Jr.
"A lot of great things have happened in this district, but the accomplishment we are most proud of is that between 90 and 95 percent of our juniors passed every single part of the TAKS. They are ready to graduate and I congratulate each and every one of you because you have done a fine job," said Villarreal, who spoke on behalf of his fellow board members. "We have the best of the best, not just in this county, but in this nation, and that is you teachers and our students. Congratulations and have a great school year." District Superintendent Roel Gonzalez focused on another amazing academic accomplishment, but challenged teachers and staff not to rest on the heels of accomplish, but to push for more and better. “There is something wonderful that no one wants to listen to. You want to know what it is? Ten years ago, the completion rate was 74 percent; that means that 26 out of every 100 kids didn't graduate high school in Rio Grande City CISD. But now, the completion rate is 96 percent and that's something that no other district in the Valley can come close to," he said. "I am telling you this because I want to leave something with you. Imagine if it was your child in that three percent that didn't make it? We have to treat each child as if they are our own. We have come a long way ladies and gentlemen, but we have a job to do. We've got to get it right and we've got to walk the walk. As we go through this year just remember that I am so proud of you; you are my pride and joy." However, the most poignant and energizing words of the morning came from the students who encouraged teachers to continue going above and beyond for them and their peers. "We would like you to guide us, assist us and challenge us as we evolve into the people we are destined to be; give us the extra push to get us ready for the future, whatever it takes, don't hold back," said Rio Grande City High School student Amanda Guerra. "We need your guidance at this very crucial time in our lives. Teachers are the ones that mold and create future doctors, lawyers, presidents and even Olympians. I want you to know how very important you are in making our dreams possible." "Teachers, you have the opportunity to impact lives like no other profession. By choosing this path, you have taken on the responsibility of being our role models," expressed Javier Lozano, a fellow RGC High student. "We students spend more time at school than at home and this makes you all our second parents. Sometimes we need people to listen and help guide us, and sometimes that person can be you. Teachers can be the guardian angels that students desperately need." "You give us hope and because you believe in us, we believe in ourselves. Thank you for being patient with us; after all, God isn't finished with us yet, and neither should you be," said Alexia Andrade, a Grulla High School student. "Please continue to believe in us, we need you. We cannot accomplish our full potential without you. Those of us who come from broken homes, we need your encouragement. Those of us who are recent immigrants, we need your patience. Those of us who have learning disabilities, we need your empathy. Those of us who are economically disadvantaged need your mentoring. Those of us who seem to always get in trouble, we need your wise counsel. Those of us who have personal issues need your understanding. Those of us who are hurting need your gentle hand. And those of us who seem to sometimes have it all, we need you the most. I hope you all have the perfect students this year, but even if you don't, please love us anyway." Caption for Photo: Rio Grande City CISD educators kick off the 2012-2013 school year with much anticipation and excitement of what this new year will bring. Central office administrators selected "Go for the Gold" as this year's theme and principals are ready to do whatever it takes to reach Olympic victory. Pictured are educators from throughout the district.